Two modes of multiplication cycle in bacteriophages namely lytic cycle and lysogenic cycle. Lytic cycle or lytic phages called as virulent phages multiplies inside the host bacterium and new viral particles comes out by lysing or by rupturing the host bacterial cell wall. Eg: T phages, T2, T4, T6 etc. 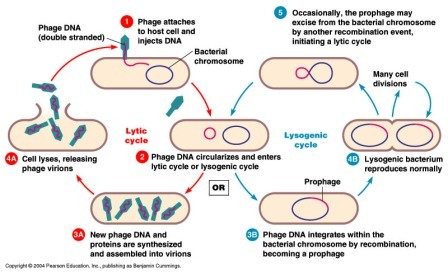 Lysogenic cycle or lysogenic phages called as temperate phages does not undergo multiplication or induce lysis, here the viral DNA gets integrated into the bacterial DNA without causing lysis. Adsorption: attachment of adsorption of tail fibres of the phage on to a specific receptor site on the bacterial cell wall. Protein synthesis: Inside the host, the viral genome directs the synthesis of viral proteins using the machinery of the host. Viral genome generally encodes for some enzymes and coat proteins. Viral genome synthesis: Viral genome replicates inside the host making several copies. Packaging and release: The viral genome gets packaged inside the protein coat. These intact mature infectious particles are called virions. The crowding of virions inside the host ultimately causes cell lysis and liberation of mature viral particles. ~ about 200 mature phages/cell are liberated. Lysogenic cycle: only differ from step III onwards. Injection: injection of viral genome into the host through the hollow tubes of the tail. Integration of viral genome to the host genome: After the entry of viral genome, it gets integrated into the bacterial genome of the host. The viral genome integrated to the bacterial genome is termed prophage. Viral genome synthesis: Viral genome replicates along with the bacterial genome replication and pass on to the daughter cells. Induction of lytic cycle: Occasionally, integrated viral genome detaches and released into the bacterial cytoplasm. This dissociation is called induction and lytic cycle is followed releasing mature lysogenic phages. Induction can be induced artificially using ultraviolet rays or heat treatment. And that is the viral story of destroying bacterium, the microbial super powers.